GCC LaserPro T500 is capable of exceptional 3D engraving quality and cutting at high speed which make it a high ROI laser system on the market. Equipped with a powerful 200W laser tube it delivers clear and fine cutting results. The CO2 laser tube is the most critical component of a laser engraver. 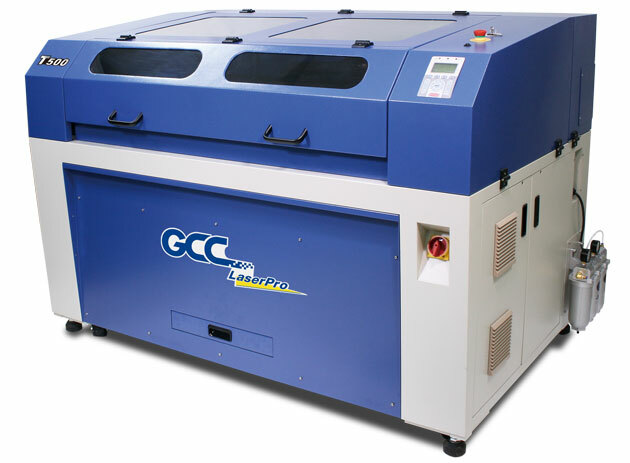 GCC LaserPro offers the best and most reliable CO2 laser available in the industry. Synrad CO2 lasers with the most advanced laser technology. The laser product is proven to be the most reliable brand with tens of thousands of installations all over the world. All GCC products are RoHS-compliant (the European Parliament Directive 2002/ 95/ EC, Restriction of Hazardous Substances) and lead-free (pb free). GCC will continue to concern and provide environmentally friendly products to protect the earth for our further generations. Material positioning made extremely easy by the use of 4 red beam diodes. Simply aim each red beam diode at distinct points on the material and the red beam becomes a very useful positioning tool to replicate previous jobs precisely. T500 has excellent engraving and cutting capabilities contained in one product. No more time wasted switching materials from cutting to engraving machines. Compare to conventional cutting products, it is difficult to have a good and consistent raster performance with large working area, but T500 can. Unique cutting table with tipped bars that can be easily adjusted without tools to create different levels of working depths. The cutting table of the T500 reduces laser reflections and delivers clear cutting edge. An LED light module that illuminates the working space and makes every engraving detail easy to see.